1. Spray a large saucepan with olive oil, and cook the onion and chilli for 5 minutes until softened. Meanwhile, remove the skin from the sausages and crumble the meat into the pan. 2. Stir in the cinnamon, cook for 1 minute then add the beans and tomatoes. Bring to the boil and simmer gently for 20-30 minutes. 3. Meanwhile, preheat the oven to 200ºC, gas mark 6. Using a pair of scissors, cut each tortilla into 8 wedges and place in a single layer on a large baking sheet. Spray the tortillas with olive oil and bake for 5-8 minutes until crisp and golden. 4. 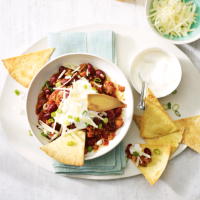 Divide the chilli between 4 bowls and push in the tortilla chips. Top with yogurt or soured cream and a sprinkling of grated cheese and salad onions, and serve. For a twist on the classic nacho serving, spoon the chilli and all the accompaniments into crispy taco shells instead.